India. His parents were religious, and prone to visions and spiritual dreams. Ramakrishna's father had a vision of the god Gadadhara (Vishnu) while on a religious pilgrimage. In the vision, the god told him that he would be born into the family as a son. Sri Ramakrishna, who was born named Gadadhar in the village of Kamarpukur in 1836 AD and passed away in 1886 AD. He represents the very core of the spiritual realizations of the seers and sages of India. His whole life was literally an uninterrupted contemplation of the Divine. A yogin named Totapuri became Ramakrishna's teacher. Sri Ramakrishna, the most revered saint in Bengal, had the astounding distinction of being declared an incarnation of God during his lifetime by many of the prominent scholars of his day. 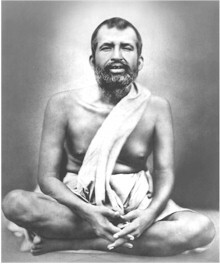 Born in the Bengali farming village of Kamarpukur in 1836 (where pilgrims gather to this day to honor him), Ramakrishna showed a unique mystical spirituality from an early age. As a small boy, he once fell to the ground paralyzed in ecstasy at the beauty of a flock of pure white cranes against the background of a dark, looming rain cloud. "All beings are esentially Divine and existance is a unity. God-realization is the supreme goal of all living beings.Unalloyed love of God is the essential thing. All else is unreal." "It is absurd to say that the world is unreal so long as we ourselves believe that we (as the ego) are real. Only one who has seen the unreality of the ego can see the unreality of the world." "I have now come to a stage of realization in which I see that God is walking in every human form and manifesting Himself alike through the sage and the sinner, the virtuous and the vicious. Therefore when I meet different people I say to myself, 'God in the form of the saint, God in the form of the sinner, God in the form of the righteous, God in the form of the unrighteous.'" "Those who have realized God are aware that free will is a mere appearance. In reality man is a machine and God its Operator; man is the carriage and God its Driver." "Unalloyed love of God is the essential thing. All else is unreal." "What are you to do when you are placed in the world? Give up everything to Him, resign yourself to Him, and there will be no more trouble for you. Then you will come to know that everything is done by His will." "Do you know what I see? I see Him as all. Men and other creatures appear to me only as hollow forms, moving their heads and hands and feet, but within is the Lord Himself." "I have now come to a stage of realization in which I see that God is walking in every human form and manifesting Himself alike through the sage and the sinner, the virtuous and the vicious. Therefore when I meet different people I say to myself, "God in the form of the saint, God in the form of the sinner, God in the form of the righteous, God in the form of the unrighteous." "If you first fortify yourself with the true knowledge of the Universal Self, and then live in the midst of wealth and worldliness, surely they will in no way affect you. When the divine vision is attained, all appear equal; and there remains no distinction of good and bad, or of high and low� Good and evil cannot bind him who has realized the oneness of Nature and his own self with Brahman." "If you must be mad, be it not for the things of the world. Be mad with the love of God� Many good sayings are to be found in holy books, but merely reading them will not make one religious. One must practice the virtues taught in such books in order to acquire love of God." "Unless one always speaks the truth, one cannot find God Who is the soul of truth. One must be very particular about telling the truth. Through truth one can realize God."